The year 2013 is the year of “social optimisation”, facilitating the spread of content marketing strategies to promote the brands and to influence the customers. Social media platforms like Twitter, Pinterest, Google+ and Facebook are fast becoming incredible tools for acquiring customers or increasing customer loyalty. Social media comes with measurable and real benefits that are hard to ignore, introducing innovative and new marketing techniques. 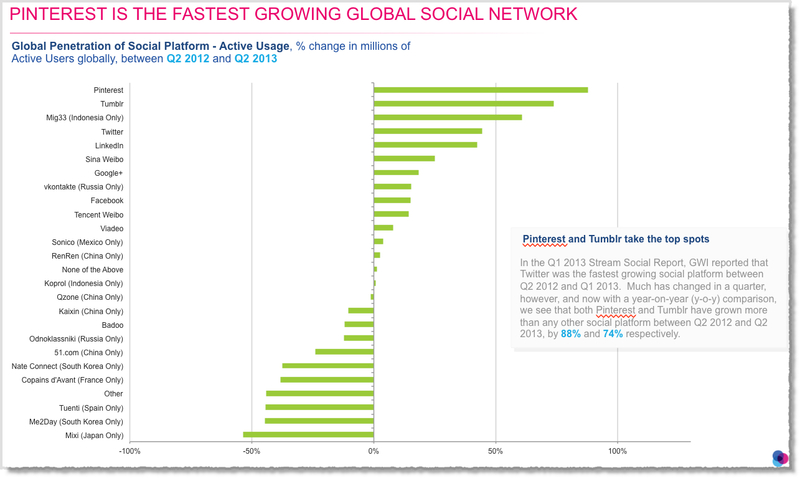 Let’s take a look at the latest social media facts and figures for the second quarter of 2013. As Facebook continues to take up more and more users in its inclusion, the number is predicted to rise more significantly with the regions and countries in the developing world including Africa, Asia and South America joining the network. 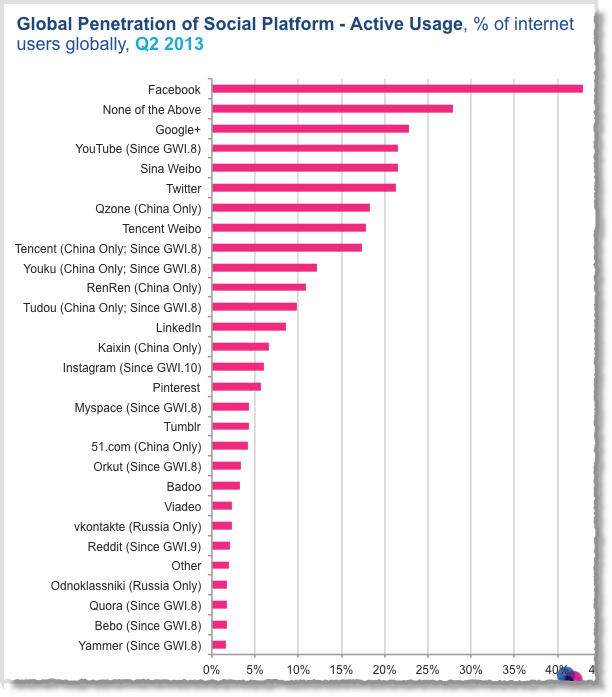 Currently, Facebook has nearly 70% of the world’s internet users as active users. In Q2 2013, South Africa had the highest proportion of Facebook active users which is 68%. 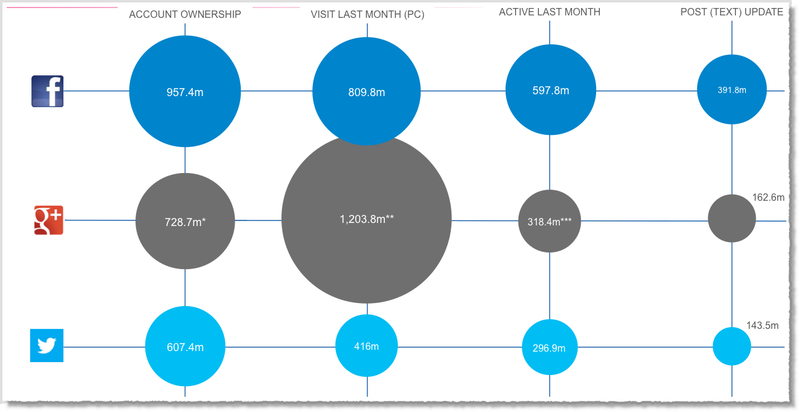 While Facebook continues to lead the group in terms of account ownership, Google+ is quickly gaining popularity, and in fact, now has the second highest number of monthly users with 50% of active users. It is reported that Google is using the platform to collect personal information (demographics, location, etc.) thus making the role of Google+ more prominent in Google’s grand scheme in terms of SEO, social signals and providing a more personalised search experience. With Google merging its new and old products, setting up Google Authorship will be a top priority for business and webmasters. Pinterest along with other image-centric social media sites like Slideshare, Path, and Tumblr will increasingly become a critical piece of any solid content strategy. This is indicative to the consistent trend seen in 2013 towards sharing through image and video, rather than text-based content. Businesses need to be mindful about this ‘sharability factor’ to obtain significant benefits from their social media marketing efforts. Pinterest and Tumblr have reportedly registered growth rates of 88% and 74% respectively and are the fastest growing social networks. With over 238 million users, LinkedIn still holds its repute as the no.1 social networking site for professionals. In fact, with the launch of the Influencers program (a network of experts and leaders in different fields who regularly publish posts which are featured on the site’s home page and email marketing campaigns) LinkedIn is positioning itself as one of the largest sources of content creation and editing for professionals. According to the latest stats, 7% of its users are over 55 years and 14% in the 45-54 range clearly indicating the popularity of the network among the older and younger demographics. The above facts indicate the growing use of social media platforms worldwide with mobile being the key driver. This noticeable growth is not only attributed to the established social networks but emerging platforms like Pinterest and Tumblr too are fast growing. The ongoing trend indicates that the statistics is going to see great changes with new networks grabbing the market share in the coming years. Wonderful concerns below. I will be incredibly satisfied to search your own document. Thanks a lot that i’m having a look to contact a person. Would you like to please lower me a mail?